I enjoyed this adaption of a crochet-chain cast-on that looks like a bind-off; may use it again. It’s actually quite stretchy because you SKIP chains in a regular rhythm: here, I skipped 1 after picking up each k2 or p2. My cast-on chain started with 50% extra stitches. Also played around a bit with the heel turn and gussets — thanks, Elizabeth Zimmermann, June Hemmons-Hiatt, and Cat Bordhi for ideas and inspiration! The lengths of color in this (discontinued) “self-striping” yarn weren’t long enough to make actual stripes, versus long blips, on any circumference greater than about 10″. I didn’t think this wool would make a nice newborn hat, so I decided on socks. 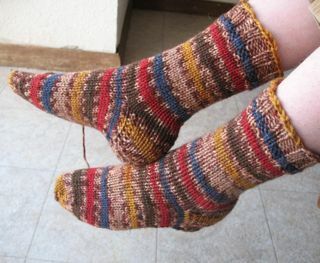 One ball not enough for adult socks — (thanks, Ravelry search-by-yarn!) — so made child’s socks. Another option might have been fingerless gloves, but I was glad to make something for elder DD (especially casting on for the project on her birthday!). I have tried quite a few self-striping yarns in the past year or so, and I do not recommend this one. 😦 Color is too short, and texture is less than the best. But I got to experiment, and I do hope DD gets some use and enjoyment out of her new handmade socks!